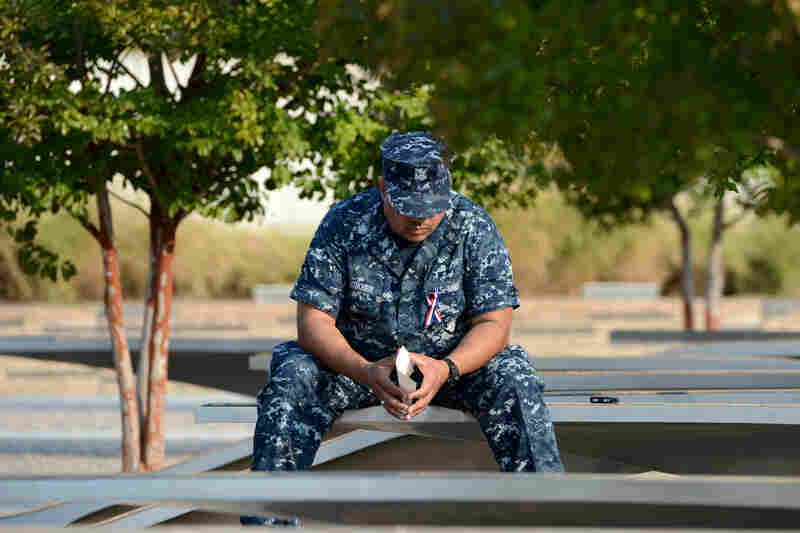 Nation Pauses To Mark Sept. 11 Attacks : The Two-Way It's been 12 years since the attacks. Just after 8:45 a.m. ET there was a moment of silence marking the time when the first plane struck the World Trade Center. There are also events at the Pentagon and in southwestern Pennsylvania, where the other jets came down. 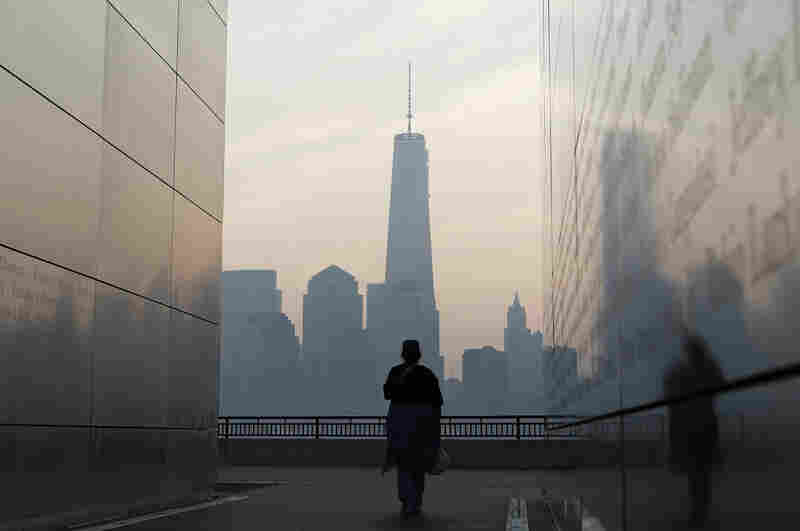 A woman looks out at One World Trade Center from inside the 9/11 Empty Sky memorial at Liberty State Park in Jersey City, N.J., on Wednesday. Americans commemorated the 12th anniversary of the Sept. 11 attacks with solemn ceremonies and pledges to not forget the nearly 3,000 people killed. 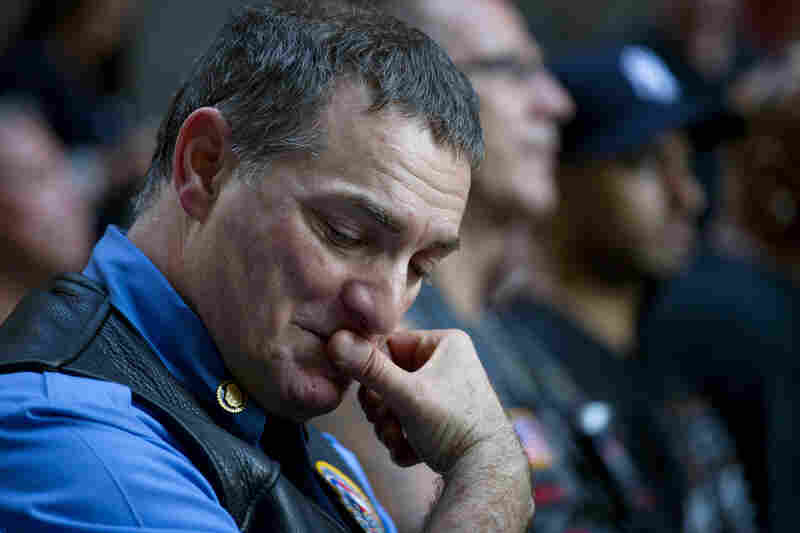 Retired FDNY Marshal Ernie Medaglia, who was at the World Trade Center on Sept. 11, listens to New York Gov. Andrew Cuomo at a ceremony near the 9/11 Memorial honoring first responders and FDNY Rescue 1. The family and friends of the passengers and crew of Flight 93 gather around a bolder that marks the plane's impact area, during a memorial service at the Flight 93 National Memorial in Shanksville, Pa.
Wakiley Ramen Chowdhury makes a rubbing of his niece's name, Shakila Yasmin, at the edge of the North Pool at the 9/11 Memorial. 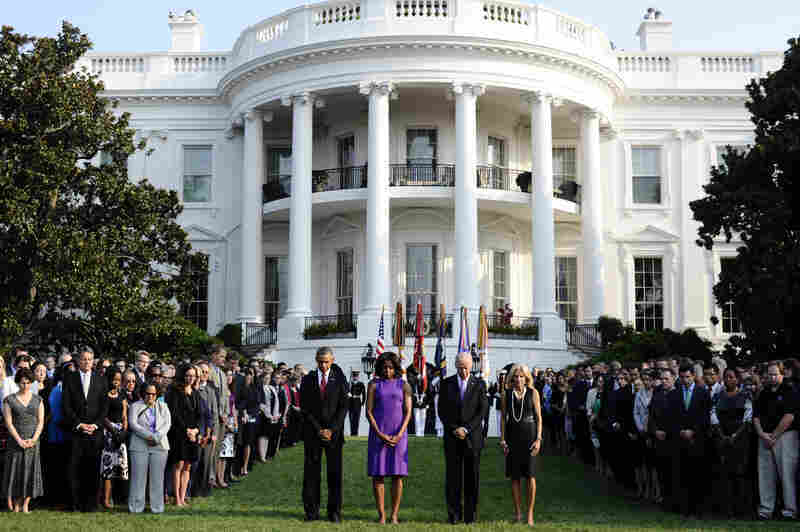 President Obama, first lady Michelle Obama, Vice President Joe Biden and Jill Biden observe a moment of silence to mark the 12th anniversary of the 9/11 attacks on the South Lawn of the White House. Kayla Fallon , whose father William Fallon died at the World Trade Center when she was 8, visits the 9/11 Memorial. A man reflects at the Pentagon Memorial outside Washington, D.C. There are 184 benches at the memorial, representing the 184 people who died at the Pentagon 12 years ago. It was just after 8:45 a.m. ET on Sept. 11, 2001, when the first jet struck the World Trade Center in New York City and the worst terrorist attack in the nation's history began. Nearly 3,000 people died. At that time this morning, many Americans paused for a moment of silence. President Obama and first lady Michelle Obama were among them. The White House, which webcast this morning's marking of the solemn anniversary by the president, says he will also visit the Pentagon for a 9:30 a.m. ET ceremony to remember those who died there 12 years ago. That too will be webcast. 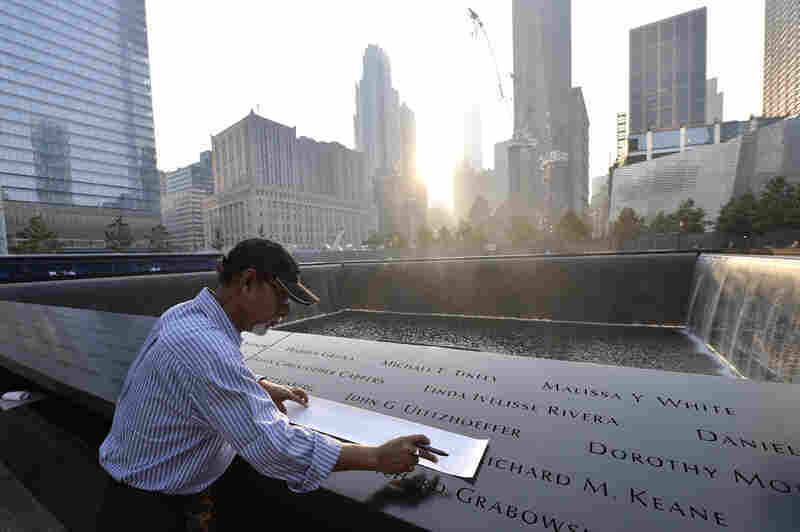 At ground zero in New York City, family members of those killed in both the 2001 and 1993 World Trade Center attacks have been invited to read their loved ones' names once again. There's a webcast of that ceremony here, starting at 8:39 a.m. ET. 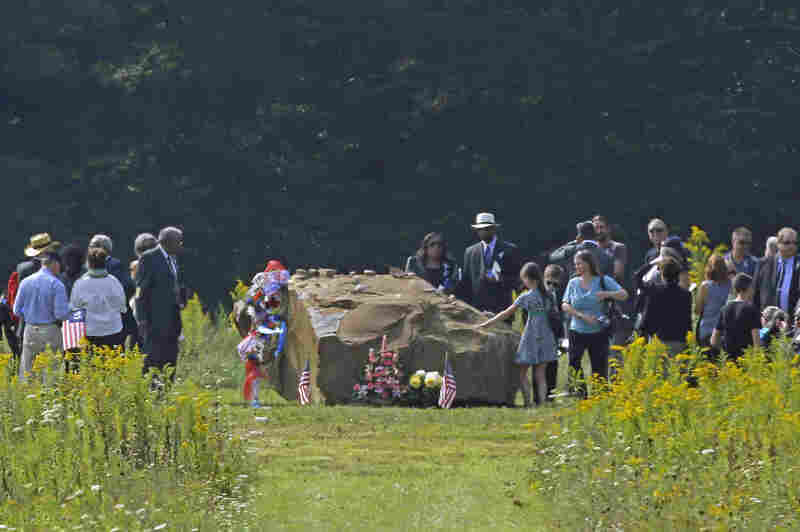 There will also be a ceremony at the Flight 93 National Memorial in southwestern Pennsylvania. Ground was broken there Tuesday for a new visitors center. The White House also asks Americans to take part in the "September 11th National Day of Service and Rememberence." At 8:45 a.m. ET, the Obamas, Vice President Biden and Jill Biden walked from the White House on to the South Lawn. They were trailed by a military honor guard and joined on the lawn by members of the White House staff. Bells tolled three times. Then "Taps" was played. At 8:47 a.m. ET, the couples returned to the White House. The only sounds heard besides the bells and "Taps" were those of birds. We'll leave the webcast player on this post because it should show the 9:30 a.m. ET event at the Pentagon.